Owen Milgrim (Jonah Hill) are two struggling strangers who are drawn to the late stages of a mysterious mind-bending pharmaceutical trial. Their reasons for participating differ as Annie is disaffected and aimless, fixated on broken relationships with her mother and sister. Owen lives his life with a disputed diagnosis of schizophrenia. 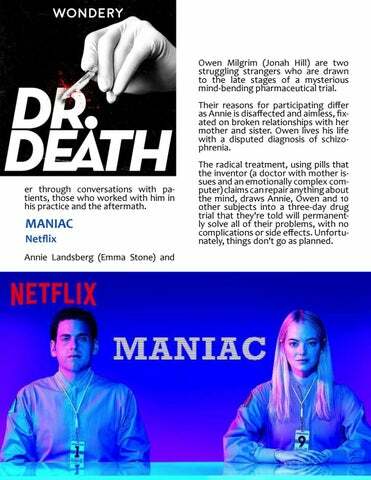 The radical treatment, using pills that the inventor (a doctor with mother issues and an emotionally complex computer) claims can repair anything about the mind, draws Annie, Owen and 10 other subjects into a three-day drug trial that they're told will permanently solve all of their problems, with no complications or side effects. Unfortunately, things don't go as planned. er through conversations with patients, those who worked with him in his practice and the aftermath.